I used to be a Boy Scout. There, I’ve said it. One of the things I loved about Scouting (besides the camping, gaming and learning about knots of course) was badge hunting. The merit badges I remember obtaining were Backpacking, Knots, Forestry, Swimming, Electricity, First Aid and Astronomy. 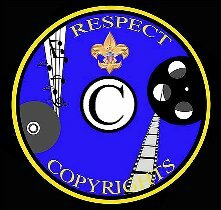 Had I been a Scout in California, I could have obtained the newest activity patch: Respect Copyright. Yes boys and girls, you can now display your loyal and kind respect for copyright law with a patch that will tell your friends that you’re a good consumer, and also that if you catch them using P2P you will turn them in to the appropriate authorities. Scouts will be instructed in the basics of copyright law and learn how to identify five types of copyrighted works and three ways copyrighted materials may be stolen. Scouts also must choose one activity from a list that includes visiting a movie studio to see how many people can be harmed by film piracy. They also can create public service announcements urging others not to steal movies or music. I have been struggling to come up with snarky remarks to the above, but alas, I have failed. Nothing beats the comedic value of the original. Really, the funny thing about this that everyone blows way out of proportion is that it is not really a scout-driven patch. Anyone in the world can create an activity patch and say, "If you come visit me, I'll give you my patch." Museums have them, campgrounds have them, training courses have them, so the movie industry put one out. Hello, i came to this blog whilst looking for some thing else, but to my joy i found this site. Maintain performing what you might be performing, its wonderful.